Brian and I decided to do major yard projects this weekend. Frankly, we were done being embarrassed of the patch of grass that wouldn’t grow near our front stoop, and the waist-high weeds on the parking strip between the sidewalk and the street. I worked so hard on our pretty blue mailbox that matches the front door, and you could hardly see it. Also, we were officially THOSE neighbors with the dandelions more prolific than the grass. The easiest course of action, we decided? Just mulch everything, and put in plants later. I bought a few to put around the mailbox, but mostly we just put down black plastic weed barrier with red mulch on top. I wasn’t sold on the red at first when Brian brought it home last year, but it looks great against our yellow house and the green plants, and it also fades to something not quite as technicolor in a few weeks. The first thing I learned is that I’m a total wimp now that I’m pregnant. I volunteered to mulch around the front stoop, figuring it would take me MAYBE a couple of hours to dig a quick trench for the edging, and pour the mulch on top. Then I could go help Brian with the bigger project. It took me all day, I re-injured my back, and I was generally an unhappy camper. I ended it all with a headache, and napped on the couch while Brian finished prepping the parking strip and planting my drought-tolerant choices near the mailbox. I was back at it on Sunday, though. I refused to lift mulch, but was helpful with the plastic and spreading all the wood chips out. 40 bags of mulch later and we’re still not done (we’re on the end of a cul-de-sac and have an epic parking strip). But we’re really close. And what’s there looks GOOD. I now have white Yarrow in my yard, which is the butch version of my favorite flower (Queen Anne’s Lace). It makes me happy every time I see it. I can hardly wait finish it, and fill in the rest in with plants. All we need now is to mulch around the base of the tree and install our tree swing, and I’m calling the front yard DONE. We can officially move on to the less-public but worse travesty that is the back yard. And maybe hire someone to mow what little of the lawn there is left. In baby news, this kid can officially hear. My pregnancy app suggests that I talk to him, but that just feels weird. I think I’m feeling him move, but I’m not certain if it’s foot flutters or my own digestion. The sensations are faint. Like someone tapping their fingers lightly against your insides once or twice before stopping. It’s a weird time of year in Southern California. The kind where I’m ready for Fall – for sweaters and boots, plenty of tea, rain dripping from the rafters, the Roger’s Red turning scarlet on the front of the house, cooler temperatures, fires in the fireplace. But not likely to get any of it. Well, I suppose I am getting cooler temperatures if you want to go with semantics. Today it was 85 and not 100+. But still, no sweaters, tea, fires, or rain. I won’t get any real “Fall” until December, probably, the way things work around here, unless I decide to go to the pumpkin patch for the manufactured variety. Christmas is about when the Roger’s Red decided to turn last year, and the giant tree on my lawn to drop its leaves. Sigh. It seems deplorably far away. So instead I’m looking at pictures on my Tumblr feed and feeling envious. I’m trying to think up stories that are Halloween themed. I’m pulling out the spider earrings, which I can wear despite the temperature. I’m contemplating fall jams. Last year, the nutmeg persimmon jam I did was really good… And there has to be something that can be done with the Ichabod Crane story that hasn’t been thought of before, right? Maybe? Maybe not. In the garden, I’m taking stock of all the plants we lost to the heat. The lemon tree made it through and so did most of the front garden, though the Butterfly Bush is traumatized and we lost a Sweet Pea hedge and a rose bush. Don’t worry, the umbrella plant I abhor took its place. And speaking of things I want to rip up, it’s time to get the tomatoes out, too, in prep for next year. They’ve officially given up the ghost and aren’t fruiting. That’s all from home. I hope that wherever you are you can enjoy the flannel I can’t. 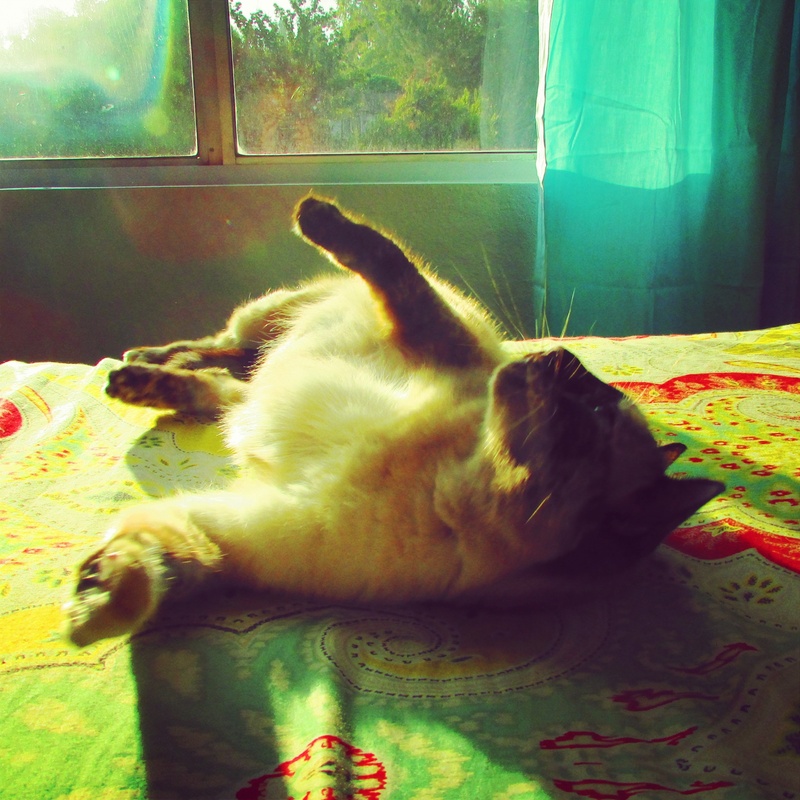 It is hot here in Southern California. I thought my office had greenhoused a little, but then I went outside and it felt like I was in an oven, so I know I shouldn’t complain about my slightly warm digs. The web said it’s 113 in Riverside today. I have been watering the poor, fragile Lemon tree in the back yard like mad, but I’m afraid it still isn’t going to make it. It’s hanging in there, though, so we’ll see. It seems like there’s going to be a very warm summer ahead of us so it has a long way to go before it’s truly safe. The tomatoes are at the point where they aren’t loving the heat either, although they’re still ripening. It’s the blooms that are burning in the sun. Success with the Brandywines, by the way! There are currently 7 tomatoes on the vine, and hopefully more to come. I’m so glad. I got 2 tomatoes out of that plant last year, and resolved that if I didn’t get more this year, I would give up eating the tastiest tomatoes I’ve ever had and go for something that was more prolific. I can justify 7 a little more than I can justify 2. Life feels pretty frantic right now. Spring came to California overnight, it seems. The tree in my front yard has gone from bare to bright green in just a few days. The neighbor’s plum tree is flowering white. The Roger’s Red Grape is budding with tiny silver leaves. Spring (of course) means gardens, and garden goals include summer tomatoes in my house. That is non-negotiable. Home grown tomatoes are the one produce item that are nothing at all like the store bought version. California summers get CRAZY hot, though, and in Redlands it is even worse than I am used to. The advice for tomato planters in a hot climate? Plant early and you will have a crop before the hot comes. They recommend February. When did it get to be almost March, you guys? I put the tomatoes in the front planter last year to thwart the gophers, but now it has ornamental stuff in it. Brian and I regrouped, and we’ve decided that if we put our veggies in raised beds in the back, we can line them with chicken wire and hopefully keep the gophers out. Which means that we need raised beds STAT, or we won’t have a crop. We bought the redwood boards, fought with the battery on the drill, and still didn’t quite get the planter built. Next weekend for sure. I have the compost, we have the dirt, and those tomatoes will be. It’s the tomato plants that are indeterminate (you see what I did there? It’s a tomato joke. It was funny. No, really). Now I just have to decide what tomato varieties to plant… and frantically plant them so they can grow in time. Brian and I never do Valentine’s Day on the actual day. It’s just better (and less expensive) to avoid the crowds. This weekend was our event: tea at the Huntington Gardens. That was going to be exciting enough, but we also accidentally wandered into their Chinese New Year celebration for bonus amazingness. Music in the white and wood Chinese garden, red lanterns everywhere, lion fights on the lawn, and the most impressive show by a man who changed to ten masks in the blink of an eye, and then balanced a ceramic teapot on a pair of chopsticks he held in his teeth. Add that to the scones and clotted cream, the impressionist gallery and the lady in the herb garden peddling recipes, and we had a perfect blue-sky day. I bought a recipe book on using herbs in cooking. I can already tell it’s going to be the best thing ever. I’m dying to try the mint/vanilla lemonade, the lavender pear tarts, and the stuffed nasturtiums. I’m dying to get that herb garden started in the back yard, despite the fact that the damn gophers are still in residence. (We’re planning to chicken-wire them out of dinner in raised beds, plus those distress call stakes, with poison as a last resort). We planted out most of one of our front planters last weekend with drought-tolerant things, and the plants I picked were all over the Huntington in their new visitor’s center. I love the landscaping there, so it made me feel like I made the right choices. It’s hard to know when they’re nothing more than spindly sticks with leaves in the pitted dirt. It’s easy to second-guess. That’s all on a lazy Monday, except to say that my rejection letter count for this year is officially 5. Trying for the 6th right now… (or, you know, an acceptance would be nice). Oh the summer weather. And I don’t mean that in a good way. It’s been HOT here. And weird. Brian managed to get some fancy drought-tolerant plants at a local fair, and we did some minor gardening this weekend. It was already 89 degrees out at 8:00 am when we went out there to dig in the dirt for a while and make sure everything had a decent soaking. About 10:00 am, a huge cloud rolled in. Along with an atmosphere of mugginess not usually experienced in Southern California. I don’t know why it’s so much different in Redlands. It’s only 30 miles away from Claremont. But when the summer clouds come up, the whole world smells like the sweet molasses of desert rain. It didn’t drop anything on us, but it stayed hazy and dusk-like until late in the afternoon, making the mountains that surround us like a bowl look purple in the distance. Like someone had ripped them out of construction paper, and not like they were real mountains at all. I feel like such a Californian in Redlands amid the eucalyptus, the orange groves, the palms, the trains and the hills.We planted California Poppies this weekend. You know, just for extra good California goodness. Unless we started keeping quail, we can’t get more representative. The tomatoes are insanely huge now. I bought the big tomato cages, and they have outgrown even those. The Roger’s Red grapevine is taller than the house. We’ve been slowly adding drought-tolerant things to the front yard, and trying to nurse through the things that are already there in the heat. The roses are burning before they even have a chance to bloom. The lawn is brownish. But the Roger’s Red seems to be thriving with just a very little bit of hose help, and has sprouted volunteers all over the front planter. I’m thrilled, since gophers ate both of the plants I had in the back yard. Come fall when the weather is cooler, I’ll re-plant them in back again. This time in gopher-proof chicken wire pots. California natives for the win, I guess. Now if we can just get all the plants through September, I shall be a happy camper. Cross your fingers for them. They’re going to need it. I have a gopher infestation second to none. No, seriously. It’s obscene in the back yard. Tunnels and holes as far as the eye can see. The yard was a blank slate when we moved in, mostly dirt. We’ve slowly been putting plants and pavers into the front yard, but the back has been low priority. In the winter rains it grew weedy and green. A veritable gopher smorgasbord and paradise, I guess, helped by the fact that Brian and I rarely go out there. It looks like someone aerated the soil. There isn’t a piece of the back yard they haven’t tunneled through. I thought the recent deadness was because of warm weather we’ve been having. I didn’t realize how wrong I was. I found out about the infestation when I tried to put my tomatoes in. I bought five lovely plants at Tomatomania. I mostly got ones that were good for hot weather, and supposedly tastier than the normal heat-tolerant varieties: Juliette Grape, Lemon Cherry, Marriage Perfect Flame (which I bought for the name, not for taste or hardiness, I admit), Cherokee Green, and Red Brandywine. 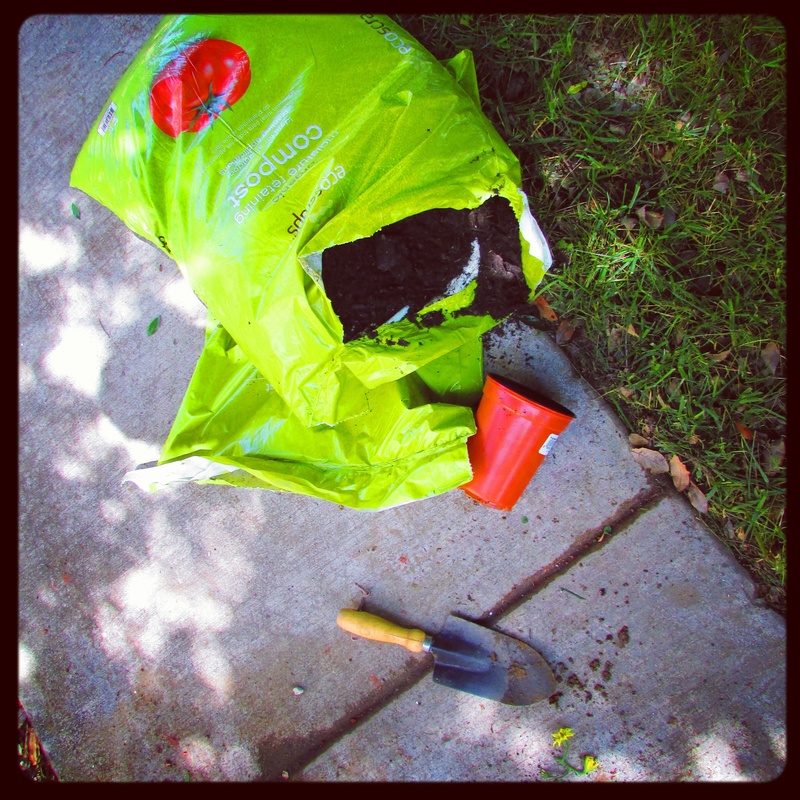 I splurged on some fancy compost on Friday, and I was all ready to dig a bed in the back yard. The Plan was veggies in the back, drought tolerant in the front. But those damn gophers. 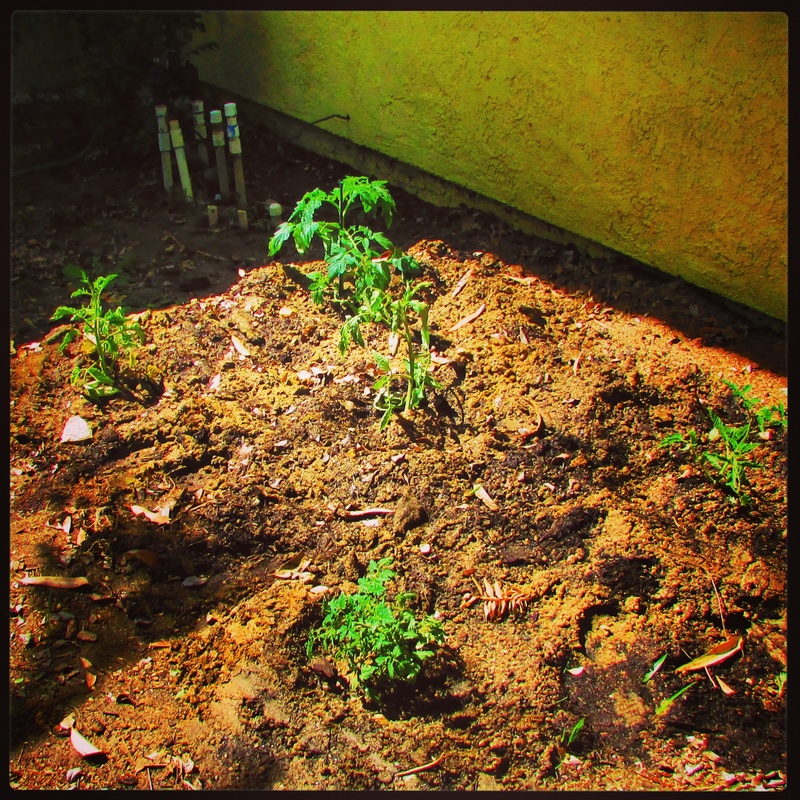 I composted the one empty bed in the front yard and put the tomatoes in there. The Cherokee Green hasn’t taken transplanting very well, but you’ll be happy to know that the Marriage is thriving, tall and deep green. Everything else seems to be doing rather well, too. Armstrong has bright blue tomato cages, so I’ll go fancy and match them to my door. I am determined to have tomatoes this year, even if it blows the garden plan to hell and makes the front of my house look rangy and dead late in the season. In the meantime, I’ll be waging gopher-war in the back so we can get on plan again for next year. They underestimated me when they tried to stand between me and fresh tomato. I have finished draft 3 of my novel. I tried out the old (but new to me) Olive Street Market in Redlands. Their sandwiches are tasty, and I have been dreaming about their sweet broccoli salad. They also have every variety of root beer known to man. I have a presentment that this will be my doom. My pocket book and my waistline will empty and expand respectively. My mother gifted me two Charles Wysocki puzzles. One of them is my favorite ever. I’ve put it together at least three times and possibly more. It’s a town scene with canaries in it, and the canaries are everywhere unlikely. The other is a group of people playing croquet on a southern plantation. I finished the border this morning, and the house last night. The dollhouse I’ve been building for thirteen years is now in my (real) house! I haven’t had a place to work on it since I got married, hence the 13 years… I’m thrilled to have it. I ripped the inferior staircase out of it and gave it a good clean. It will be non shell-like soon, I hope. I have wallpaper all picked out. I fed the horribly neglected roses in my yard last week. There are four bushes, and they’re the only plants in the yard I don’t abhor (why Brian has a fondness for the umbrella plant, I will never know). The one we thought was mostly dead started blooming yesterday, small magenta roses about the size of a half-dollar. So that’s what’s going on in the sweltering suburb of Redlands. Students come back next week, and the job changes again.